Regulatory T cells can restrict the uncontrolled immune response and inflammation, avoiding pathologic immune injury to the host and thus playing important roles in the maintenance of immune homeostasis. Until recently, many subsets of CD4 and CD8 regulatory T cells have been reported. In this study, we identified CD11chighCD8+ T cells as a new subset of CD8+ regulatory T cells. During Listeria monocytogenes and Staphylococcus aureus infection, two subsets of CD8 T cells were classified according to the expression level of CD11c, including CD11clowCD8+ and CD11chighCD8+ T cells. CD11clowCD8+ T cells, existing during the whole period of infection, act as conventional activated T cells to kill target cells in a perforin-dependent manner. Interestingly, CD11chighCD8+ T cells appeared only at a late stage of infection, expressed relatively high CD122 and low CD69, did not secrete IFN-γ, IL-10, TGF-β, and exhibited much more potent cytotoxicity against target cells via Fas ligand–Fas pathway in an Ag-independent manner. Ligation of CD11c was important in the cytotoxicity of CD11chighCD8+ T cells. Furthermore, CD11chighCD8+ T cells could directly kill the activated CD4 T cells both in vitro and in vivo, whereas CD11clowCD8+ T cells could not. Thus, we identified an infection-induced new subset of CD11chighCD8+ regulatory T cells, which might contribute to protect host from pathological immune injure. Our results indicate that CD11c+CD8+ T cells are constitute a heterogeneous population that can be divided further into regulatory CD11chighCD8+ T cell subset and effector CD11clowCD8+ T cell subset, thus adding insight to the role of CD8 T cells in immune response and regulation. Regulatory T cells (Tregs) have important roles in the maintenance of immune homeostasis and in fine regulation of immune responses against infection and tumor (1–4). In addition to the immunosuppressive effects of Tregs in the chronic infection– and tumor-bearing host, Tregs are important in the negative regulation of immune response at the late stage, limiting the magnitude of the immune response and contributing to avoid self-tissue damage caused by a vigorous immune response (5). According to their origin, development, and mechanism of action, CD4 Tregs can be divided into two main subsets: natural Foxp3+ Tregs (nTregs) and induced Tregs (iTregs), which include IL-10–producing T regulatory 1 cells, TGF-β–producing Tregs and induced Foxp3+ Tregs (6, 7). Both nTreg cells and iTregs have been shown to play important roles in the immunity against infection (5). Immunosuppressive functions of Tregs can be mediated by immunosuppressive cytokines, such as IL-10 and TGF-β, by cell-cell direct contact of suppressor cells with effector cells, or by instructing dendritic cells (DCs) to increase tryptophan metabolism or secrete suppressive cytokines (8). We previously also identified a novel tumor-induced CD69+CD25−CD4+ regulatory T cell subset, which suppresses antitumor immune response through membrane-bound TGF-β (9). Several CD8 Tregs have been discovered and functionally analyzed, such as Qa-1/HLA-E–restricted CD8 Tregs (10–12), CD8+CD122+ Tregs (13), CD8+CD28− Tregs (14, 15), CD8+CD25+Foxp3+ Tregs (16), CD8+CD103+ Tregs (17), CD8+LAG-3+Foxp3+CTLA-4+ Tregs (18), IL-10+CCR7+CD45RO+CD8+ Tregs (19), and CD8+CD45RClow Tregs (20). However, comprehensive studying of CD8 Tregs is hindered by a lack of specific common markers and key transcription factors. In addition, there might be a new subset of CD8 Tregs at the late stage of immune response, which is helpful to avoid overactivation of the immune response and help to balance the immune system, which needs to be identified further and functionally investigated. CD11c, the αX subunit of the αXβ2 (CD11c/CD18) integrin, is the first DC marker to be identified and has been instrumental in the identification and characterization of DC subsets (21). In addition to DCs, some subset of CD8 T cells was reported to express CD11c (22). CD8 T cells expressing CD11c was first reported in 1987, when it was observed that CD11c was expressed by some human CTL clones and was involved in cell-mediated cytolysis by these clones (23). CD11c+CD8+ T cells were a subset of activated, Ag-specific, cytotoxic T cells that exhibited potent antiviral effects in vitro and in vivo (24). Therefore, it seems that CD11c is an activated marker of CD8 T cells and that CD11c+CD8+ T cells can serve as CTLs. However, CD11c+CD8+ T cells—induced and expanded by inoculation of agonistic anti-4-1 BB mAb in collagen type II–induced arthritis mice (25), experimental autoimmune uveoretinitis mice (26), and hapten-induced colitis mice (27)—were found to be regulatory T cells that suppressed Ag-specific CD4 T cells through an IDO-dependent mechanism. In addition, CD11c+CD8+ T cells in small intestine, but not in large intestine, were recently identified as a distinct intestinal regulatory T cell population to control proinflammatory CD4 T cells and maintain intestinal mucosal homeostasis (28). Therefore, it is suggested that CD11c+CD8+ T cells perform effector functions or regulatory functions in different settings. These observations inspired us to consider that CD11c+CD8+ T cells are probably heterogenous populations that include effector subsets and regulatory subsets. In this study, we have identified a new CD11chighCD8+ regulatory T cell subset, which appears in the spleen of mice infected with Listeria monocytogenes and Staphylococcus aureus infected at the late stage of immune response (day 8 after L. monocytogenes infection). CD11chighCD8+ T cells express relatively high CD122 but low CD69; they do not secrete IFN-γ, IL-10, or TGF-β, and they exhibit potent cytotoxicity against target cells by expressing high levels of Fas ligand (FasL). Importantly, we have demonstrated that CD11chighCD8+ T cells can kill the activated CD4 T cells both in vitro and in vivo. Therefore, at the late stage of L. monocytogenes infection, the infection-induced CD11chighCD8+ T cells can downregulate CD4 T cell response via the FasL–Fas pathway, contributing to the control of the immune response at the late stage and protecting self-tissues from immunopathologic damage. Our results provide insight to the immunobiology of CD8 T cells, as the regulatory cells, in the infection and immune regulation. C57BL/6 mice were obtained from Joint Ventures Sipper BK Experimental Animal Co. (Shanghai, China) and used at the age of 6–8 wk. The OVA-specific TCR transgenic OT-I mice and DO11.10 mice, FasL-deficient mice, and perforin-deficient mice on a C57BL/6 background were obtained from The Jackson Laboratory and bred in specific pathogen-free conditions. All experimental manipulations were undertaken in accordance with the National Institutes of Health Guide for the Care and Use of Laboratory Animals, with the approval of the Scientific Investigation Board of the Second Military Medical University, Shanghai, China. 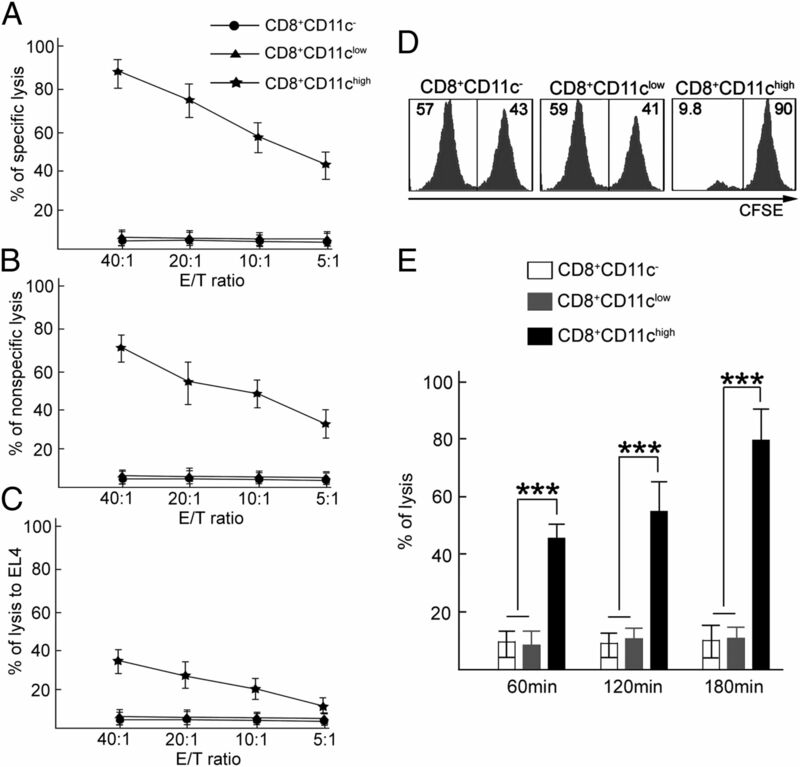 The Abs for flow cytometry, including Abs against CD11c (N418), CD69 (1H.2F3), CD25 (PC61), CD122 (5H4), CD44 (IM7), CD62L (MEL-14), TCR DO11.10 (KJ1-26), IL-4 (11B11), IL-10 (JES5-16E3), IFN-γ (XMG1.2), TGF-β (2Ar2), CD8 (53-6.7), TCR-β (H57-597), neutralizing anti-CD11c (N418) and anti-FasL (MFL3) mAb, and activating anti-CD3 (145-2C11) and anti-CD28 (37.51) mAbs were obtained from BD Pharmingen. PMA, ionomycin, and OVA323-339 were obtained from Sigma-Aldrich (St. Louis, MO). Intracellular staining kits and ELISA kits were obtained from R&D Systems. 7-Aminoactinomycin D and CFSE were obtained from Invitrogen. L. monocytogenes strain (rLM6) and OVA-transfected L. monocytogenes strain (LmOVA) were provided by Dr. Hao Shen (University of Pennsylvania School of Medicine, Philadelphia, PA). Bacteria were grown overnight in brain-heart infusion broth, washed twice with PBS, aliquoted in PBS 10% glycerol, frozen, and stored at −80°C. Aliquots were thawed, and bacterial titers were determined by plating serial dilutions on brain-heart infusion broth agar plates. For infection, aliquots were thawed and appropriately diluted in PBS, and 1 × 104 bacteria were injected in a volume of 200 μl PBS into the lateral tail veins of mice as described previously (29). Bacteria in the spleen and liver were measured at the appropriate time after infection by homogenization and lysis of tissues in 5 ml of 0.05% (v/v) Triton X-100, followed by plating onto brain-heart infusion plates. Total colonies per liver or spleen were counted after incubation overnight at 37°C (29, 30). Staphylococcus aureus strain FDA209 (6538) was obtained from American Type Culture Collection (Manassas, VA). For infection, aliquots were thawed and appropriately diluted in PBS, and 1 × 106 bacteria were injected in a volume of 150 μl PBS into the lateral tail veins of mice as described previously (31). For intracellular staining, cells were stimulated with 25 ng/ml PMA and 1 μg/ml ionomycin for 24 h at 37°C, and brefeldin A (10 μg/ml) was included for the last 6 h of incubation. Cells were collected and stained with the Abs against cell-surface Ags, and then fixed and permeabilized with the Cytofix/Cytoperm kit according to the manufacturer’s instructions (eBioscience). The cells were washed with permeabilization buffer and labeled with PE-conjugated anti–IFN-γ, anti–IL-4, anti–IL-10, anti–TGF-β1 mAbs or the respective isotype controls. Flow cytometry was done with a FACS LSRII, and data were analyzed with FACSDiva software (BD Biosciences). Single-cell suspensions of splenocytes were prepared from L. monocytogenes–infected mice (day 8). The cells were stained with anti-CD8 FITC and anti-CD11c PE, and then CD11chighCD8+ T cells, CD11clowCD8+ T cells and CD11c―CD8+ T cells were sorted respectively by MoFlo high-speed cell sorter (Dako). The purity of each population was confirmed by FACS to be > 97%. Activated OVA-specific CD4+KJ1-26+ T cells were purified from splenocytes of LmOVA infected (DO11.10×C57BL/6) F1 hybrid mice (day 8), and activated Ag-nonspecific CD4+CD69+ T cells were purified from naive splenic CD4 T cells (isolation by MACS) after activated in vitro for 5 d with IL-2 (500 U/ml), anti-CD3 (10μg/ml) mAb and anti-CD28 (2μg/ml) mAb. Before cocultured with CD8 T cell subsets, purified CD4+KJ1-26+ T cells were stimulated with IL-2 (500 U/ml) and OVA323-339 peptides (20 ng/ml) for 2 h at 37°C. CD11chighCD8+ T cells, CD11clowCD8+ T cells and CD11c-CD8+ T cells were seeded at 5 × 105 cells/well in 96-well plates respectively, and incubated with OVA-transfected EL4 target cells (EG7) or activated CD4 T cells for 6 h at 37°C at the indicated E:T ratio. In some experiments, neutralizing anti-FasL mAb or anti-CD11c mAb were included in the coculture system. The cytotoxicity of CD8 T cell subsets against EG7 target cells or activated CD4 T cells was measured using flow cytometry as previously described (32, 33). Cells were collected, stained with 7-aminoactinomycin D and analyzed by FACS LSRII. Live target cells were determined by gating on CD8―7AAD― populations. Percentage of cytotoxicity was calculated by the following equation: 100% × (CD8― cells − CD8―7AAD― cells)/(CD8― cells). In vivo cytotoxicity assay of CD8 T cell subsets was performed as previously described (34) with modification. Activated CD4+CD69+ T cells and nonactivated CD4+CD69- T cells (control) were purified from splenocytes of L. monocytogenes–infected C57BL/6 mice (day 8), and then stained with 0.05 μM CFSE (CFSElow) and 0.5 μM CFSE (CFSEhigh), respectively. These labeled cells were mixed in equal proportion and then transferred i.v. (1 × 106 cells of each population) into C57BL/6 mice. After 0.5 h, purified CD11chighCD8+ T cells, CD11clowCD8+ T cells, and CD11c−CD8+ T cells from splenocytes of L. monocytogenes–infected C57BL/6 mice (day 8) were transferred i.v. (5 × 106 cells of each population) into each groups of mice. At the indicated times (after 1, 2, 3 h), the proportion of CFSElow cells and CFSEhigh cells in total CFSE positive cells from the mice were calculated by flow cytometry. Percentage of cytotoxicity was calculated by the following equation: 100% – 100% × (CFSElow cells %/CFSEhigh cells % of experimental group)/(CFSElow cells %/CFSEhigh cells % of control group). For detection of IFN-γ, IL-6, or TNF-α secretion, cell supernatants or serum were collected, and the cytokine concentrations were determined by ELISA kits according to the manufacturer’s instructions (R&D). For analyzing the functions of diverse CD8 T cell subsets in bacterial infection, we infected mice with L. monocytogenes and then analyzed the variation of splenic CD8 T cells at different times. Among the phenotype markers of T cells, the expression of CD11c on splenic CD8 T cells attracted our attention. Splenic CD8 T cells from normal C57BL/6 mice barely express CD11c (Fig. 1A). After infection of L. monocytogenes, the expression of CD11c on splenic CD8 T cells was low but increased. About 21.5% CD8 T cells expressed CD11c on day 6. However, the proportion of CD11c+CD8+ T cells significantly increased to ∼62.9% on day 8. Next, the proportion of CD11c+CD8+ T cells declined, to ∼19.4% on day 10, and maintained at ∼10% on day 12 after infection (Fig. 1A, 1B). Expression of CD11c on splenic CD8 T cells after L. monocytogenes infection. (A) Flow cytometry analysis of splenocytes from L. monocytogenes–infected mice stained with anti-CD3 FITC, anti-CD8 Percp, and anti-CD11c PE. The dot plots represent one of five independent experiments with similar results. (B) Statistical analysis of CD11c+ cells in total CD8+ T cells (%). (C) Titers of L. monocytogenes in the spleen and liver at different days after L. monocytogenes infection. Means ± SEM (n = 5; 10 mice per group). Interestingly, we also found that the expression level of CD11c on splenic CD8 T cells on day 8 was much higher than that at other days, and obviously there was a subset of CD11chighCD8+ T cells on day 8 (Fig. 1A). To further study the relationship between CD11c expression and function of CD8 T cells after L. monocytogenes infection, we classified three subsets of CD8 T cells according to the expression of CD11c, including CD11c−CD8+ T cells, CD11clowCD8+ T cells, and CD11chighCD8+ T cells (Fig. 2A). As shown in Fig. 1A, CD11chighCD8+ T cells appeared only on day 8 after infection, whereas CD11clowCD8+ T cells existed during the whole period of infection and their proportion remained almost unchanged. CD11chighCD8+ T cells are induced in the mice with S. aureus infection. (A) Flow cytometry analysis of splenocytes from S. aureus–infected mice stained with anti-CD3 FITC, anti-CD8 Percp, and anti-CD11c PE. The dot plots represent one of three independent experiments with similar results. The concentrations of IL-6 (B) and TNF-α (C) in the serum of S. aureus–infected mice are shown. Means ± SEM (n = 3; 10 mice per group). Because CD11c is the relatively specific marker of DCs and some subsets of DCs do express CD8 (34), we further set to determining whether these CD11chighCD8+ cells were T cells. We found that the CD11chighCD8+ cells expressed T cell markers, including CD3 and TCR-β, but did not express MHC class II molecule (data not shown). In addition, CD11chighCD8+ cells also expressed CD8β, which expressed on CD8 T cells, but not on CD8+ DCs (data not shown) (35). Therefore, we confirmed that these CD11chighCD8+ cells were CD8 T cells, not CD8+ DCs. To confirm the validity of our L. monocytogenes infection model, we determined the bacterial burdens in the spleen and liver at different times after infection. As shown in Fig. 1C, the bacterial titers in the spleen and liver peaked on day 2 of infection, and then it declined. The bacteria in the spleen were completely eliminated on day 8, whereas the bacteria in the liver were completely eliminated on day 12. These data revealed that CD11chighCD8+ T cells only appeared at the late stage of L. monocytogenes infection and may not function in the clearance of bacteria. Therefore, we hypothesized that these CD11chighCD8+ T cells might possess biological functions, such as negative regulator at the late stage of immune response. To elucidate whether CD11chighCD8+ T cells are restricted to L. monocytogenes infection, we created the murine model of metastatic chronic osteomyelitis initiated after i.v. inoculation of S. aureus microorganism, which mimics human osteomyelitis caused by S. aureus (31). We found that S. aureus infection also induced CD11chighCD8+ T cells that appeared on day 20 after infection and disappeared on day 30 (Fig. 2A). Although these cells maintained much longer in S. aureus infection than that in L. monocytogenes infection, the proportion of CD11chighCD8+ T cells in splenic CD8 T cells in S. aureus infection (∼6%; Fig. 2A) was much lower than in L. monocytogenes infection (∼50%) (Fig. 1A). As a result, we chose L. monocytogenes–infected mice to study CD11chighCD8+ T cells further. To confirm the validity of our S. aureus–infection model, we detected IL-6 and TNF-α concentrations in the serum at different times after infection. As shown in Fig. 2B and 2C, the concentrations of IL-6 and TNF-α in the serum peaked on day 10 of infection and then declined. On day 35 after infection, their concentrations declined to the normal levels; therefore, we confirmed that in the S. aureus infection process, CD11chighCD8+ T cells only induced and maintained at the late stage of anti-infection immune response, whereas CD11clowCD8+ T cells existed during the whole period of infection, just as in the L. monocytogenes infection process. Next, we analyzed the phenotype of CD11chighCD8+ T cells, comparing them with CD11clowCD8+ T cells. We found that there was no obvious difference in the expression of CD44 and CD62L (Fig. 3A, 3C), CD25 and CD28 (data not shown), between CD11clowCD8+ T cells and CD11chighCD8+ T cells. Interestingly, CD11chighCD8+ T cells expressed relatively high CD122 (∼81.9%; 2506 of mean fluorescence intensity [MFI]), low CD69 (∼17.1%; 336 of MFI). In contrast, CD11clowCD8+ T cells expressed relatively low CD122 (∼ 58.8%; 1473 of MFI), high CD69 (∼33.6%; 2108 of MFI; Fig. 3A, 3B). Phenotype of CD11chighCD8+ T cells. (A) Flow cytometry analysis of CD11c−CD8+ T cells, CD11clowCD8+ T cells, and CD11chighCD8+ T cells (day 8) stained with anti-CD69 PE, anti-CD44 PE, anti-CD62L PE, and anti-CD122 PE, respectively. The dot plots represent one of five independent experiments with similar results. The MFI of CD69 and CD62L (B) and CD44 and CD62L (C) on three subsets of CD8 T cells observed above. Means ± SEM (n = 5; 10 mice per group). Furthermore, we analyzed the cytokine profile of CD11chighCD8+ T cells, also comparing them with CD11clowCD8+ T cells. We found that ∼42.7% of CD11clowCD8+ T cells expressed IFN-γ, whereas CD11chighCD8+ T cells and CD11c−CD8+ T cells scarcely expressed IFN-γ (Fig. 4A). None of these three CD8 T cell subsets expressed IL-4, IL-10, or TGF-β (data not shown). ELISA assay of IFN-γ secretion by these CD8 T cell subsets was performed to confirm the results of intracellular staining. The supernatants from purified CD11c−CD8+, CD11clowCD8+, and CD11chighCD8+ T cells stimulated with PMA and ionomycin were collected, and IFN-γ concentration was determined. Accordingly, CD11clowCD8+ T cells secreted a plenty of IFN-γ after stimulation, whereas CD11chighCD8+ T cells didn’t secrete IFN-γ with or without stimulation (Fig. 4B). The data suggest that CD11clowCD8+ T cells are conventional activated CD8 T cells, and CD11chighCD8+ T cells display a diverse phenotype with CD11clowCD8+ T cells, suggesting different biological functions. Low IFN-γ production but high cytotoxic activity of CD11chighCD8+ T cells. (A) Intracellular IFN-γ expression from CD11c−CD8+ T cells, CD11clowCD8+ T cells, and CD11chighCD8+ T cells was analyzed by flow cytometry. The dot plots represent one of four independent experiments with similar results. (B) CD11c−CD8+ T cells, CD11clowCD8+ T cells, and CD11chighCD8+ T cells were purified and stimulated with PMA and ionomycin for 48 h. Supernatants were collected for IFN-γ assay by ELISA. (C) Purified CD11chighCD8+ T cells, CD11clowCD8+ T cells, and CD11c−CD8+ T cells from LmOVA-infected mice were incubated with EG7 target cells for 6 h at the indicated E:T ratio, and cytotoxicity was measured by flow cytometry. Means ± SEM (n = 3; 5 mice per group). ***p < 0.01. For further exploration of the function of CD11chighCD8+ T cells, we analyzed the cytotoxicity of three subsets of CD8+ T cells. CD11c−CD8+, CD11clowCD8+, and CD11chighCD8+ T cells were purified from splenocytes of LmOVA-infected mice on day 8, and then cocultured with OVA-transfected EL4 (EG7) target cells for 6 h in vitro. We found that CD11c−CD8+ T cells had poor cytotoxicity, and CD11clowCD8+ T cells displayed moderate cytotoxicity against EG7 target cells (Fig. 4C). Interestingly, CD11chighCD8+ T cells possessed much more potent cytotoxicity against EG7 target cells, and the percentage of lysis reached 80% at the 40:1 E:T ratio (Fig. 4C). We further analyzed the cytotoxic mechanism of these CD8 T cell subsets. As shown in Fig. 5, anti-FasL mAb almost abrogated the cytotoxicity of CD11chighCD8+ T cells but did not affect the cytotoxicity of CD11clowCD8+ T cells. Accordingly, FasL-deficient CD11chighCD8+ T cells lacked potent cytotoxicity, whereas FasL-deficient CD11clowCD8+ T cells possessed similar cytotoxicity as wild type CD11clowCD8+ T cells. However, deficiency of perforin obviously decreased the cytotoxicity of CD11clowCD8+ T cells, whereas perforin-deficient CD11chighCD8+ T cells possessed cytotoxicity similar to that of wild type CD11chighCD8+ T cells. These data suggest that CD11clowCD8+ T cells and CD11chighCD8+ T cells kill target cells in a perforin- or FasL-dependent way, respectively. Next, we analyzed the function of CD11c in the cytotoxicity of these CD8 T cell subsets. Blockade of CD11c moderately decreased the cytotoxicity of CD11clowCD8+ T cells and obviously decreased the cytotoxicity of CD11chighCD8+ T cells (Fig. 5), suggesting that the ligation of CD11c on CD8 T cells and its ligands on target cells might play an important role in the cytotoxicity of these CD8 T cell subsets, especially for CD11chighCD8+ T cells. CD11chighCD8+ T cells kill target cells via FasL. CD11chighCD8+ T cells (A) and CD11clowCD8+ T cells (B) were purified from splenocytes of LmOVA-infected C57BL/6 mice (day 8), and cocultured with EG7 target cells for 6 h (E:T ratio = 40:1). Anti-CD11c mAb or anti-FasL mAb were included as indicated. In some experiments, the CD8 T cell subsets were purified from splenocytes of LmOVA-infected, FasL, or perforin-deficient mice (shown as FasL−/− and Perforin−/−). Cytotoxicity against EG7 target cells was measured by flow cytometry. Means ± SEM (n = 3; 5 mice per group). *p > 0.05, **p < 0.05, ***p < 0.01. On the basis of the above observation that CD11chighCD8+ T cells kill EG7 target cells via FasL–Fas pathway, we went further to detect the level of FasL expression on these CD11chighCD8+ T cells when interacting and killing the target cells. We first detected the expression levels of FasL on CD11c−CD8+ T cells, CD11clowCD8+ T cells, and CD11chighCD8+ T cells from splenocytes of L. monocytogenes–infected mice at day 8 ex vivo. We found that CD11c−CD8+ T cells scarcely expressed FasL, and only a small percentage of CD11clowCD8+ T cells (∼6%) expressed FasL. In contrast, CD11chighCD8+ T cells expressed higher FasL (∼16%). After culture alone in vitro for 6 h, the expression levels of FasL of these CD8 T cell subsets remained unchanged (Fig. 6A). Interestingly, after coculturing with EG7 cells, the expression of FasL on CD11chighCD8+ T cells increased (∼50%), but the expression of FasL remained unchanged on CD11c−CD8+ T cells and CD11clowCD8+ T cells (Fig. 6A). Next, we analyzed the role of CD11c in the FasL expression of CD11chighCD8+ T cells during coculture with EG7 cells. When anti-CD11c mAb was added to the coculture system, FasL expression on CD11chighCD8+ T cells was not affected (Fig. 6B). These data suggest that, compared with CD11c−CD8+ T cells and CD11clowCD8+ T cells, CD11chighCD8+ T cells express relatively higher FasL, and coculture with target cells can obviously upregulate FasL expression on CD11chighCD8+ T cells. However, the ligation of CD11c on CD8 T cells and its ligands on target cells is not responsible for the upregulation of FasL on CD11chighCD8+ T cells. The molecules responsible for the upregulation of FasL expression on CD11chighCD8+ T cells during interaction with target cells needs to be identified in the future. Elevated FasL expression on CD11chighCD8+ T cells after coculturing with EG7 target cells. (A) Purified CD11chighCD8+, CD11clowCD8+, and CD11c−CD8+ T cells were cultured alone or with EG7 cells for 6 h, and then FasL expression was measured by flow cytometry. The dot plots represent one of three independent experiments with similar results. (B) Anti-CD11c mAb or isotype control were added to the coculture system in (A), and FasL expression on CD11chighCD8+ T cells was measured by flow cytometry. Means ± SEM (n = 3; 5 mice per group). *p > 0.05, ***p < 0.01. As CD11chighCD8+ T cells appeared only on day 8 of L. monocytogenes infection, when the bacteria were cleared and the anti-infectious immune responses needed to be terminated to avoid pathologic immune damage to the host, we speculated that CD11chighCD8+ T cells might be involved in the negative regulation of the immune response as the infection-induced novel subset of regulatory T cells. CD11chighCD8+ T cells did not secrete inhibitory cytokines such as IL-10 or TGF-β (data not shown); however, CD11chighCD8+ T cells could kill EG7 target cells via FasL–Fas pathway, and the cytotoxicity of these cells was much more potent than that of conventional activated CD11clowCD8+ T cells. Considering that potent cytotoxicity was not essentially needed to eliminate the pathogens on day 8 of infection and also activated CD4 T cells expressed high Fas, we hypothesized that CD11chighCD8+ T cells might downregulate immune response by killing the activated CD4 T cells. First, we analyzed OVA-specific cytotoxicity of CD11chighCD8+ T cells against the activated CD4 T cells in vitro, compared with CD11c−CD8+ T cells and CD11clowCD8+ T cells. CD11c−CD8+ T cells, CD11clowCD8+ T cells, and CD11chighCD8+ T cells were purified from splenocytes of LmOVA-infected OT-I mice (day 8). OVA-specific activated CD4+KJ1-26+ T cells purified from LmOVA-infected (DO11.10×C57BL/6) F1 hybrid mice (day 8) were used as target cells. After coculture of cells for 6 h, we found that CD11c−CD8+ T cells and CD11clowCD8+ T cells could not kill the activated CD4+KJ1-26+ T cells, whereas CD11chighCD8+ T cells possessed potent cytotoxicity (Fig. 7A), which is in accordance with their discriminative FasL expression. The percentage of lysis reached 90% at the 40:1 E:T ratio, even higher than that against EG7 target cells. CD11chighCD8+ T cells kill activated CD4 T cells in vitro and in vivo. (A) OVA-specific cytotoxicity of CD8 T cell subsets against activated CD4 T cells in vitro. CD11chighCD8+ T cells, CD11clowCD8+ T cells, and CD11c−CD8+ T cells purified from LmOVA-infected OT-I mice were cocultured with the activated CD4+KJ1-26+ target cells purified from LmOVA-infected (DO11.10×C57BL/6) F1 hybrid mice. Cells were collected, and cytotoxicity was measured by flow cytometry. (B) Ag-nonspecific cytotoxicity of CD8 T cell subsets against the activated CD4 T cells in vitro. CD11chighCD8+ T cells, CD11clowCD8+ T cells, and CD11c−CD8+ T cells purified from L. monocytogenes–infected mice were cocultured with Ag-nonspecific CD4+CD69+ target cells activated in vitro. Cytotoxicity was measured by flow cytometry. (C) CD11chighCD8+ T cells kill EL4 cells in vitro. CD11chighCD8+ T cells, CD11clowCD8+ T cells, and CD11c−CD8+ T cells purified from L. monocytogenes–infected mice were cocultured with EL4 cells for 6 h, and the cytotoxicity was measured by flow cytometry. (D and E) Cytotoxicity of CD8 T cell subsets against the activated CD4 T cells in vivo. Activated CD4+CD69+ T cells and control CD4+CD69− T cells stained with low and high CFSE, respectively, were mixed in equal proportions and then transferred i.v. into C57BL/6 mice. After 0.5 h, purified CD11chighCD8+ T cells, CD11clowCD8+ T cells, and CD11c−CD8+ T cells were transferred. CFSE-positive cells from splenocytes 3 h after transfer of CD8 T cell subsets are shown (D). At the indicated time points, in vivo killing was detected by flow cytometry (E). Means ± SEM (n = 3; 5 mice per group). ***p < 0.01. Next, to confirm that these cells kill target cells in an Ag-specific or nonspecific manner, we analyzed Ag-nonspecific cytotoxicity of CD11chighCD8+ T cells against the activated CD4 T cells in vitro. CD11c−CD8+ T cells, CD11clowCD8+ T cells, and CD11chighCD8+ T cells were purified from splenocytes of L. monocytogenes–infected mice (day 8). Naive CD4 T cells from normal mice were activated in vitro for 5 d with IL-2, anti-CD3, and antiCD28 mAbs, and CD4+CD69+ T cells were purified as target cells. We found that CD11c−CD8+ T cells and CD11clowCD8+ T cells could not kill the activated CD4+CD69+ T cells either, whereas CD11chighCD8+ T cells possessed potent cytotoxicity, although the percentage of lysis was only ∼70% at the 40:1 E:T ratio (Fig. 7B). Together, these data demonstrate that CD11chighCD8+ T cells can kill the activated CD4 T cells in vitro in an Ag-independent manner. Because CD11chighCD8+ T cells kill target cells in an Ag-independent fashion, we detected whether CD11chighCD8+ T cells could kill EL4 cells directly. CD11c−CD8+ T cells, CD11clowCD8+ T cells, and CD11chighCD8+ T cells purified from splenocytes of L. monocytogenes–infected mice (day 8) were cocultured with EL4 cells for 6 h in vitro. We found that CD11c−CD8+ T cells and CD11clowCD8+ T cells could not kill EL4 cells, whereas CD11chighCD8+ T cells could, although the percentage of lysis was only ∼35% at the 40:1 E:T ratio (Fig. 7C), much lower than that needed to kill EG7 cells (∼80%), suggesting that the Ag might also have a role in the cytotoxicity process. We went further to analyze the cytotoxicity of CD11chighCD8+ T cells against the activated CD4 T cells in vivo. Activated CD4+CD69+ T cells and naive CD4+CD69− T cells (control) were used as target cells and were stained with 0.05 μM CFSE and 0.5 μM CFSE, respectively. The cells were mixed in equal proportion and then transferred i.v. into C57BL/6 mice. After 0.5 h, purified CD11chighCD8+, CD11clowCD8+, and CD11c−CD8+ T cells were also transferred. We found that after transfer of CD11chighCD8+ T cells, the activated CD4 T cells (CFSElow) were decreased (Fig. 7D). The percentage of lysis showed a time-dependent effect, increasing from ∼45% after 1 h after transfer to ∼80% after 3 h (Fig. 7E). In contrast, the activated CD4 T cells were not obviously decreased after transfer of CD11clowCD8+ or CD11c−CD8+ T cells (Fig. 7D, 7E). Therefore, the data suggest that CD11chighCD8+ T cells, but not CD11clowCD8+ T cells or CD11c−CD8+ T cells, can kill the activated CD4 T cells in vitro and in vivo, by which CD11chighCD8+ T cells, acting as regulatory T cells, might negatively regulate the immune response at the late stage of anti-infection process. To study the functions of diverse CD8 T cell subsets in bacterial infection, we analyzed the variation of phenotypes and functions of CD8 T cells in the spleens of the mice with L. monocytogenes infection. We found that splenic CD8 T cells from the L. monocytogenes–infected mice began to express CD11c with peak expression of CD11c on day 8 of infection, and thus discovered a new CD8 T cell subset. To analyze the relationship between CD11c expression and functions of CD8 T cells, we classified three subsets of CD8 T cells according to the level of CD11c expression, including CD11c−CD8+ T cells, CD11clowCD8+ T cells and CD11chighCD8+ T cells. We found that CD11c−CD8+ T cells expressed low activating markers CD69, CD44, and CD122 but highly expressed CD62L, could not secrete IFN-γ, and had no ability to kill target cells, whereas CD11clowCD8+ T cells expressed relatively high activating markers, could secrete a plenty of IFN-γ, and could kill EG7 target cells in a perforin-dependent manner. Therefore, these data prove that CD11c−CD8+ T cells are nonactivated CD8 T cells, which is in accordance with a previous report (24), and CD11clowCD8+ T cells are conventional activated CD8 T cells. Our result, that conventional activated CD8 T cells kill target cells by perforin, is also in agreement with a previous report (36). In contrast with the CD11c−CD8+ T cells and CD11clowCD8+ T cells, CD11chighCD8+ T cells expressed relatively high CD122 and low CD69. Analogous to nonactivated CD8 T cells, CD11chighCD8+ T cells cannot secrete IFN-γ with or without stimulation, but they possess potent cytotoxicity against target cells by expressing a high level of FasL. These data suggest that CD11chighCD8+ T cells are different from the nonactivated CD8 T cells, and conventional activated CD8 T cells might possess unique functions. Considering that these cells possess potent cytotoxicity and appear only at the late stage of infection, when the host has no need of high-cytotoxic CTLs to kill bacterial infected cells, we hypothesized that CD11chighCD8+ T cells might downregulate immune response by killing activated T cells. Indeed, we proved that CD11chighCD8+ T cells could kill the activated CD4 T cells both in vitro and in vivo in an Ag-independent manner. Although CD4 T cells and CD8 T cells are both essential to the anti–L. monocytogenes immune response, we found that CD11chighCD8+ T cells can kill only the activated CD4 T cells, but not the activated CD8 T cells, suggesting that CD11chighCD8+ regulatory T cell feedback inhibits CD4 T cell response, but not CD8 T cell response. In addition to L. monocytogenes infection, we also found that CD11chighCD8+ T cells could be induced in the S. aureus infection, with maintaining longer time but lower proportion. The data suggest that CD11chighCD8+ T cells are not restricted to L. monocytogenes, but might have roles in other kinds of pathologic processes, such as chronic infection. Therefore, we identified the infection-induced CD11chighCD8+ T cells as a novel CD8 regulatory T cell subset. Previous reports have proved that Qa-1–restricted CD8 regulatory T cells inhibit immune response by directly killing CD4 T cells (10). For example, Qa-1–restricted CD44+ICOSL+CXCR5+CD8+ regulatory T cells are essential for self-tolerance by killing TFH cells via perforin (37). Although Qa-1–restricted CD8 regulatory T cells and CD11chighCD8+ regulatory T cells both inhibit immune response by directly killing CD4 T cells, these two CD8 T cell populations are hardly the same subset. First, Qa-1–restricted CD8 regulatory T cells are naturally occurring cells, whereas CD11chighCD8+ regulatory T cells are infection induced; second, the former kills CD4 T cells by perforin, and the latter kills CD4 T cells via FasL-Fas pathway; third, the main function of the former is to maintain self-tolerance, and the main function of the latter is to downregulate immune response at the late stage of infection (10, 37). Recently, glatiramer acetate was found to ameliorate inflammatory bowel disease in mice through the induction of Qa-1–restricted CD8 regulatory T cells, whose suppressive activity depended on perforin-mediated cytotoxicity against pathogenic CD4 T cells (38). Moreover, novel human regulatory CD8 T cell clones were isolated from healthy human peripheral blood following in vitro stimulation with autologous EBV-specific CD4 T cells, whose suppressive activity was mediated through lysis of target CD4 T cells in a cell-contact–dependent manner (39). Therefore, CD4 T cell–killing, regulatory CD8 T cells exist in mice and humans. In addition, both human CD4 nTregs and iTregs exhibit perforin-dependent cytotoxicity against a variety of autologous target cells, including CD4 and CD8 T cells, monocytes, and DCs (40, 41). Therefore, CD8 and CD4 Tregs could exhibit immune suppressive functions by killing target T cells. Previous reports suggest that CD11c+CD8+ T cells might possess opposing functions, serving as effector cells or regulatory cells in different settings (22). Our study might contribute to this contradiction. We consider that CD11c+CD8+ T cells constitute a heterogeneous population that can be further divided into regulatory CD11chighCD8+ T cell subset and effector CD11clowCD8+ T cell subset. CD11clowCD8+ T cells are much easier to be induced and expanded than the CD11chighCD8+ T cell subset; therefore, most reports found that CD11c+CD8+ T cells served as conventional activated CD8 T cells (22–24). For example, it was found that CD11c+CD8+ T cells possess higher levels of LCMV-specific killing activity than CD11c−CD8+ T cells (42); anti–4-1BB mAb administration to B16F10 melanoma-bearing mice induced potent expansion of CD11c+CD8+ T cells in parallel with suppression of tumors (43, 44). However, CD11chighCD8+ T cells might be induced and expanded only in unique conditions, such as on day 8 of L. monocytogenes infection in this study, or after agonistic anti–4-1 BB mAb inoculation in autoimmune or inflammatory disorders (25–27). CD11c/CD18, also known as αXβ2, p150/95 and complement receptor 4 (CR4), belongs to β2 integrin family, which also includes CD11a/CD18, CD11b/CD18, and CD11d/CD18 (21). CD11c binds to soluble and matrix ligands including iC3b, LPS, fibrinogen, and collagen, and cellular ligands including ICAM-1, ICAM-2, ICAM-4, VCAM-1, and Thy-1 (45, 46). CD11c/CD18 has an important role in phagocytosis, chemotaxis, and regulation of immune response (45). However, it remains to be seen whether the ligation of CD11c on effector cells and its ligands on target cells has an important role in cytotoxicity of CTLs. It was demonstrated that mAb directly against CD11c could inhibit the cytotoxic activity of two human CTL clones (23), whereas incubation with mAb had no effect on the cytotoxicity of CD11c+CD8+ T cells from mice infected with respiratory syncytial virus (24). In this study, we demonstrate that blockade of CD11c ligation with its ligands inhibits the cytotoxic activity of both CD11chighCD8+ T cells and CD11clowCD8+ T cells, especially for the CD11chighCD8+ T cells. We also suggest that potent cytotoxicity of CD11chighCD8+ T cells might be partially attributable to high expression of CD11c. We have proved that CD11chighCD8+ T cells kill target cells through FasL–Fas pathway. However, CD11chighCD8+ T cells do not express high levels of FasL alone, but coculture with target cells induces FasL expression on CD11chighCD8+ T cells. Therefore, we predict that cytotoxicity of CD11chighCD8+ T cells is a multistep process; interaction of effector cells and target cells can induce FasL expression, which results in target cell apoptosis. The first step, the interaction of effector cells and target cells, depends on the ligations between many cell-surface molecules on CD8 T cells and target cells, such as CD11c. Although CD11chighCD8+ T cells kill the activated CD4 T cells in an Ag-independent fashion, the ligation of Ag and TCR could also have a role in the cytotoxicity of CD11chighCD8+ T cells, at least enhancing the cytotoxic ability. We found that the cytotoxic ability of CD11chighCD8+ T cells against Ag-specific target cells (∼90%) was stronger than that against Ag-nonspecific target cells (∼70%). Furthermore, we also found that CD11chighCD8+ T cells could kill EL4 cells (∼35%), and the ability was lower than that to kill EG7 target cells (∼80%), which also supports our hypothesis. In summary, we have identified a new subset of CD11chighCD8+ regulatory T cells that was induced and expanded at the late stage of L. monocytogenes and S. aureus infection. Although there was no secretion of IFN-γ, IL-10, or TGF-β, the new CD8 regulatory T cell subset possesses potent cytotoxicity to target cells via the FasL–Fas pathway, and it inhibits CD4 T cell immune response by killing the activated CD4 T cells. We thank Dr. Hao Shen for providing the L. monocytogenes strain and LmOVA strain and Jianqiu Long and Xiaoting Zuo for technical assistance. This work was supported by grants from the National Natural Science Foundation of China (30801041, 31170843, 81123006), the National Key Basic Research Program of China (2013CB530503), the National 125 Key Project of China (2012ZX10002014-001), and the Foundation for the Author of National Excellent Doctoral Dissertation of the People’s Republic of China (201071).
. 2010. FOXP3+ regulatory T cells in the human immune system. Nat. Rev. Immunol. 10: 490–500.
. 2012. Regulatory immune cells in transplantation. Nat. Rev. Immunol. 12: 417–430.
. 2009. Regulatory T cells in the control of host-microorganism interactions. Annu. Rev. Immunol. 27: 551–589.
. 2012. Induced CD4+Foxp3+ regulatory T cells in immune tolerance. Annu. Rev. Immunol. 30: 733–758. 2005. Mechanisms of suppression by suppressor T cells. Nat. Immunol. 6: 338–344.
. 2009. CD69+ CD4+ CD25- T cells, a new subset of regulatory T cells, suppress T cell proliferation through membrane-bound TGF-β 1. J. Immunol. 182: 111–120.
. 2011. Regulation of self-tolerance by Qa-1-restricted CD8(+) regulatory T cells. Semin. Immunol. 23: 446–452.
. 2004. 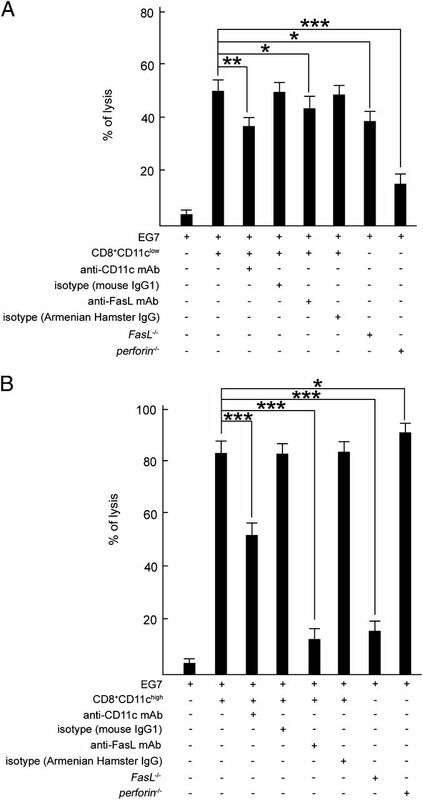 Analysis of regulatory CD8 T cells in Qa-1-deficient mice. Nat. Immunol. 5: 516–523.
. 2004. Essential roles of CD8+CD122+ regulatory T cells in the maintenance of T cell homeostasis. J. Exp. Med. 200: 1123–1134.
. 2011. CD8+ CD28- and CD8+ CD57+ T cells and their role in health and disease. Immunology 134: 17–32.
. 2007. The role of CD8+CD28 regulatory cells in suppressing myasthenia gravis-associated responses by a dual altered peptide ligand. Proc. Natl. Acad. Sci. USA 104: 17459–17464.
. 2008. Generation of highly suppressive adaptive CD8(+)CD25(+)FOXP3(+) regulatory T cells by continuous antigen stimulation. Eur. J. Immunol. 38: 640–646.
. 2006. 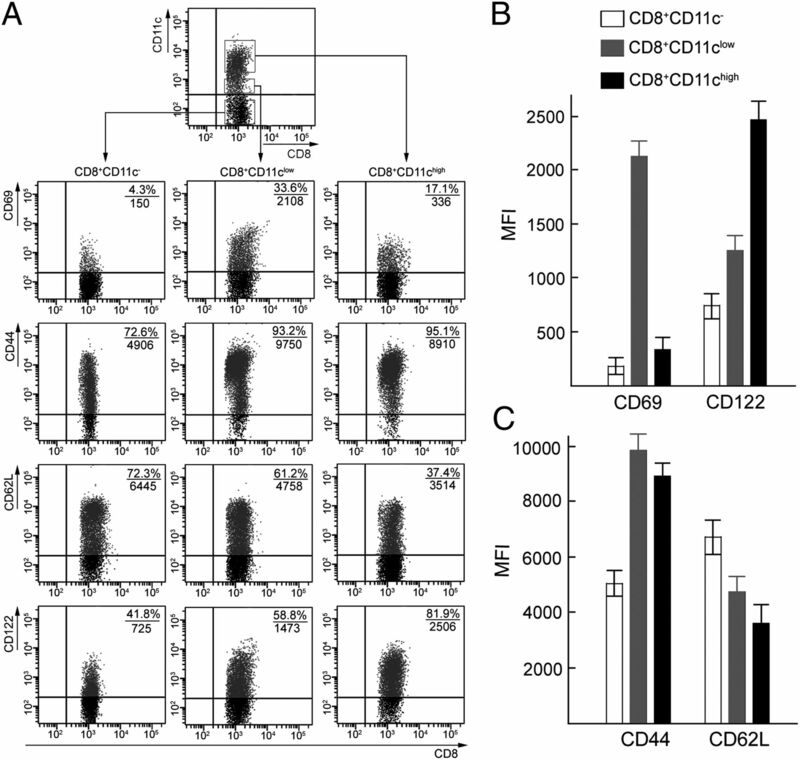 CD103 is a marker for alloantigen-induced regulatory CD8+ T cells. J. Immunol. 177: 2775–2783.
. 2011. Human plasmacytoid dendritic cells induce CD8+ LAG-3+ Foxp3+ CTLA-4+ regulatory T cells that suppress allo-reactive memory T cells. Eur. J. Immunol. 41: 1663–1674.
. 2005. 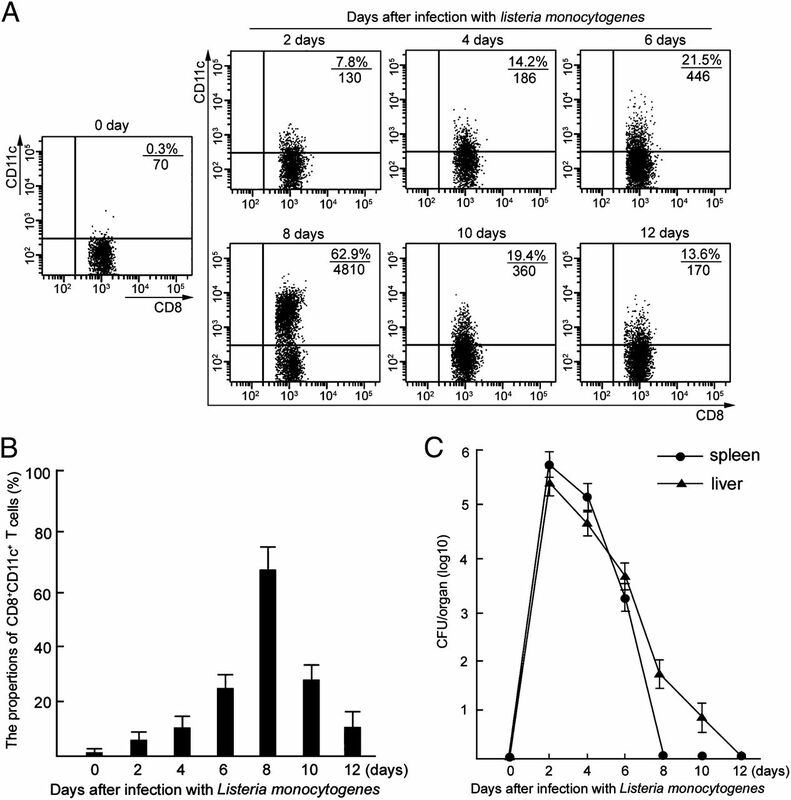 Plasmacytoid dendritic cells induce CD8+ regulatory T cells in human ovarian carcinoma. Cancer Res. 65: 5020–5026.
. 2010. CD11c+CD8+ T cells: two-faced adaptive immune regulators. Cell. Immunol. 264: 18–22.
. 1987. Membrane glycoprotein p150,95 of human cytotoxic T cell clone is involved in conjugate formation with target cells. J. Immunol. 138: 3130–3136.
. 2005. The beta2 integrin CD11c distinguishes a subset of cytotoxic pulmonary T cells with potent antiviral effects in vitro and in vivo. Respir. Res. 6: 70–81.
. 2006. 4-1BB-mediated amelioration of experimental autoimmune uveoretinitis is caused by indoleamine 2,3-dioxygenase-dependent mechanisms. Cytokine 34: 233–242.
. 2009. Origins and functional basis of regulatory CD11c+CD8+ T cells. Eur. J. Immunol. 39: 1552–1563.
. 2011. Small intestine CD11c+ CD8+ T cells suppress CD4+ T cell-induced immune colitis. Am. J. Physiol. Gastrointest. Liver Physiol. 300: G939–G947.
. 2011. 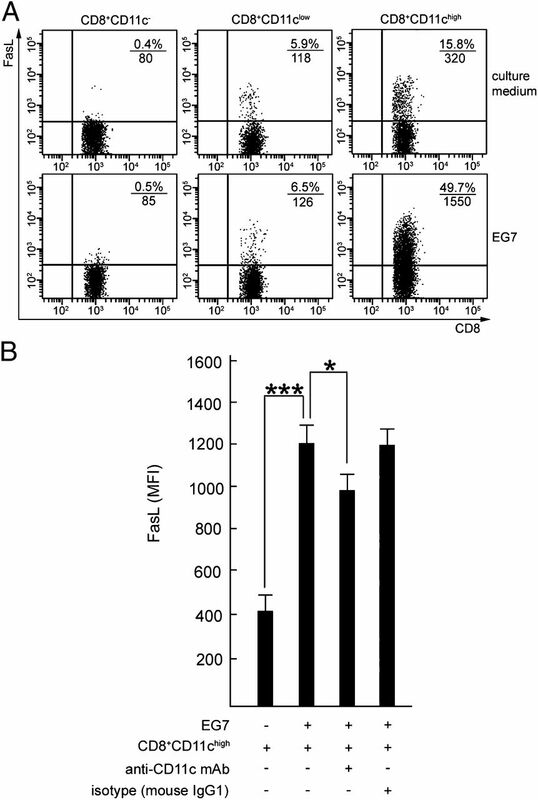 The microRNA miR-29 controls innate and adaptive immune responses to intracellular bacterial infection by targeting interferon-γ. Nat. Immunol. 12: 861–869.
. 2012. A novel mouse model of Staphylococcus aureus chronic osteomyelitis that closely mimics the human infection: an integrated view of disease pathogenesis. Am. J. Pathol. 181: 1206–1214.
. 2009. Cancer-expanded myeloid-derived suppressor cells induce anergy of NK cells through membrane-bound TGF-β 1. J. Immunol. 182: 240–249.
. 2010. IL-17A-producing gammadeltaT cells promote CTL responses against Listeria monocytogenes infection by enhancing dendritic cell cross-presentation. J. Immunol. 185: 5879–5887.
. 2003. Cutting edge: rapid in vivo killing by memory CD8 T cells. J. Immunol. 171: 27–31.
. 2008. Migration of dendritic cell subsets and their precursors. Annu. Rev. Immunol. 26: 293–316.
. 2000. Cutting edge: antilisterial activity of CD8+ T cells derived from TNF-deficient and TNF/perforin double-deficient mice. J. Immunol. 165: 5–9.
. 2013. Glatiramer acetate ameliorates inflammatory bowel disease in mice through the induction of Qa-1-restricted CD8+ regulatory cells. Eur. J. Immunol. 43: 125–136.
. 2012. A clonal model for human CD8+ regulatory T cells: unrestricted contact-dependent killing of activated CD4+ T cells. Eur. J. Immunol. 42: 69–79.
. 2004. Differential expression of granzymes A and B in human cytotoxic lymphocyte subsets and T regulatory cells. Blood 104: 2840–2848.
. 2004. Human T regulatory cells can use the perforin pathway to cause autologous target cell death. Immunity 21: 589–601.
. 2007. Marked expansion of CD11c+CD8+ T-cells in melanoma-bearing mice induced by anti-4-1BB monoclonal antibody. Mol. Cells 24: 132–138.
. 2007. Mechanisms involved in synergistic anticancer immunity of anti-4-1BB and anti-CD4 therapy. Cancer Res. 67: 8891–8899.
. 2007. CD11c/CD18: novel ligands and a role in delayed-type hypersensitivity. J. Leukoc. Biol. 81: 1395–1403.
. 2007. Red-cell ICAM-4 is a ligand for the monocyte/macrophage integrin CD11c/CD18: characterization of the binding sites on ICAM-4. Blood 109: 802–810.